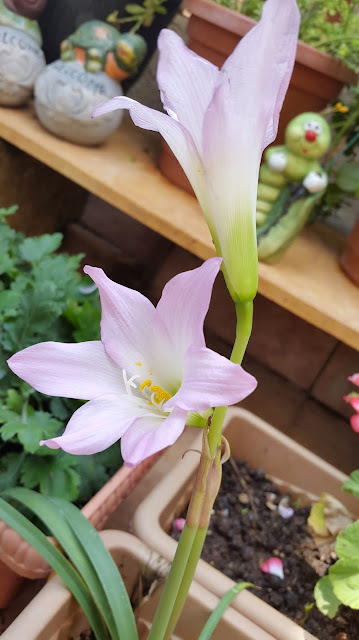 Lillies that bloomed in my garden. I had planted them last year. They lay dormant, barely letting their presence felt. There were no flowers at all for a year. Just a few straggly leaves. Our of sheer laziness to do anything I let it be. I watered it like all other plants, lavishing extra care on roses, chrysanthemums and other pretty flowers which vied with each other for my attention, while the lily stood quietly in the background. And when she bloomed every other flower paled in comparison. Sometimes life is like that. You might think that all your efforts are going unrecognised, unrewarded. And suddenly you get something that you never expected. May you have a lot of lillies in your life. And may they bloom when you need it the most. Something similar happened with me. Not in my garden but with myself. I kept working hard for something I thought was my target, but when the target shuddered, i got disappointed. Very disheartened. After about an year my phone rang. And it was for something I could have only wished for. All my hard work got paid. I never even had thought I would be rewarded like this. As they say "God gives you what you deserve and not what you ask." May be we deserve more than we ask for. Its only the dark clouds that disrupts us to see the clear sky, once they are gone its only bright light. Congrats on the ad! Eager n excited to see it. Lovely thought.. The patience and perseverance bear fruit..may not be sooner, but later..but it does..no matter what..
we need patience and keep working hard without bothering for rewards. surely, God will take care of the later part.! So true.. and the lily is really beautiful..
Gorgeous Lillies! Good things come to those who wait. I have been following this motto for a very long time now. Hope to have a lot of lillies in my life too.